The Queen arrived at Balmoral in July and stayed at another property on the estate while the castle was still open for visitors, making her official arrival in August. As we have done in the past during Her Majesty's official summer holiday, we'll gather any sightings during the break in this post. September 18: NEW! Sunday church, and a golden brooch I can't quite identify. 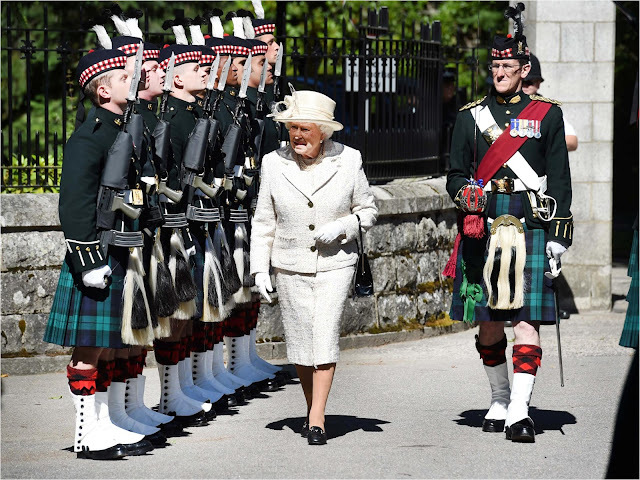 The Queen also hosted new Prime Minister Theresa May for a Balmoral visit. September 11: Sunday church, but no brooch. The Queen has also been pictured driving around the Balmoral estate with The Duchess of Cambridge and with Carole Middleton; pictures at the Daily Mail. September 4: Sunday church again, this time with a pretty purple outfit and the Kent Amethyst Brooch. September 3: The annual Braemar Gathering, covered here. August 14: The Queen can be seen arriving at church in bright pink in this video. August 8: Official arrival at Balmoral Castle, with a review of a Royal Guard from The Royal Highland Fusiliers, 2nd Battalion The Royal Regiment of Scotland. The Royal Regiment of Scotland Badge rests on her natty suit. 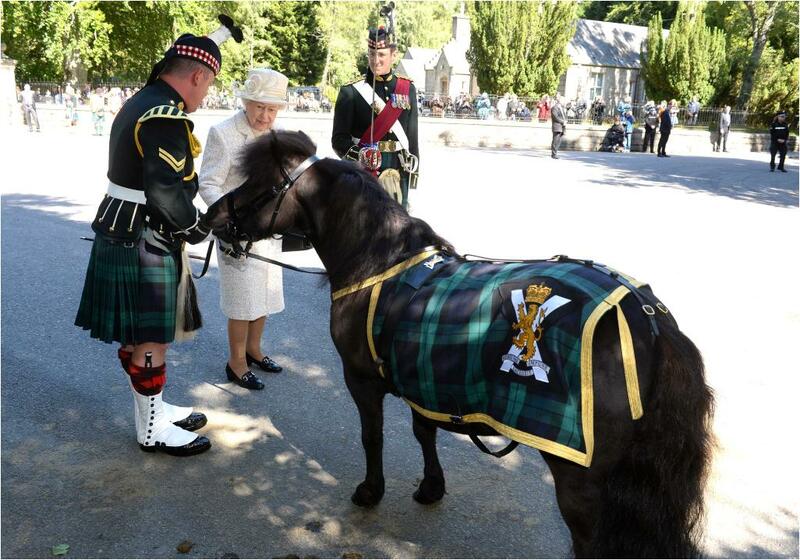 Plus, an opportunity to check in on Regimental Mascot Cruachan IV! A must for the start of any summer break. July 31: The Queen arrived at church in a hat that was, apparently, "the talk of the town". But no brooch visible. July 24: The Queen arrived at church in a beige summer tweed. No brooch visible.